How Does Radiosurgery Differ From Radiation Therapy? Traditional radiotherapy treats cancer cells, but adjacent normal cells also receive exposure to radiation. In order to prevent radiation damage to the surrounding normal cells, patients often require up to 40 treatments, allowing the normal cells to recover between treatments. 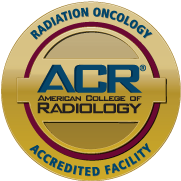 Radiosurgery, on the other hand, delivers a much higher dose of radiation to a tumor, while relying on pin-point accuracy to avoid radiation exposure to the surrounding healthy cells. This precision is maintained in three-dimensional space, meaning radiosurgery is “stereotactic.” Due to this requirement, stereotactic radiosurgery has traditionally been limited to the treatment of intracranial tumors. A stereotactic head frame would hold the patient’s head firmly in place, eliminating movement as a concern and guaranteeing treatment delivery with the precision necessary to spare normal tissues and critical structures. Capable of real-time tumor tracking and treatment delivery throughout the entire body, the CyberKnife M6 provides a more powerful and flexible radiosurgery platform without the need to rigidly immobilize patients.